After years of experience, Benedict is a proven expert on condom use and has sufficient authority to declare that condoms are ineffective, even counter-productive in health protection. The dickhead. 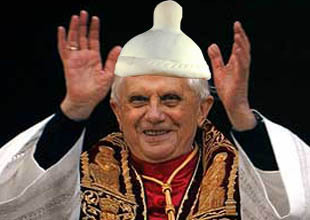 VATICAN - Health expert, moral advisor and pope Benedict XVI has made a public remark to the effect that the use of condoms does in fact aggravate the problem of AIDS in Africa and elsewhere. Of course, he will not offer such a statement out of nowhere. Benedict has personally conducted a wide range of field tests until he stuck his neck out so far. In the course of his current Africa excursion, Benedict will elaborate on the issue and discuss his new condom experience with local Catholics in further detail. He has more to tell than just a risk assessment regarding sexually transmitted diseases. In an interview he already said that "the thingies not only fail to prevent HIV infection. I also seem to have caused several unwanted pregnancies, and off the record, they also just don't feel right." After the statement went public, even the followers of the rival Flying Spaghetti monster took a break. Up to now, the Church of the FSM actively promoted condom use, but it seems that they are not blind to the hard scientific evidence provided by the Pontiff. "We are the last people to ignore new insights. Before we continue spreading outdated advice we will contact the pope and discuss best sexual practice. Who knows, this might be a fresh start for ecumenism as well," said a noodly speaker.